Ensure that your chassis hardware configuration meets the requirements described in Chassis Hardware Requirements. Admin (a) role privileges are required in Oracle ILOM to modify any Sun Blade Zone Manager properties. To access the Sun Blade Zone Manager, click System Management > SAS Zoning. The SAS Zoning page appears. In the Sun Blade Zone Manager section, click Detailed Setup. 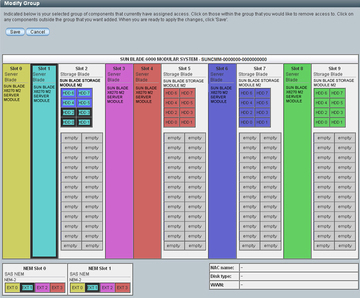 The Zoning Config dialog appears, displaying the existing storage allocations in color-coded groups. Note - Any HDD slots that do not have a storage device installed are labeled “empty.” Empty HDD slots are not assigned to CPU blade servers. To modify the storage allocations for a blade storage group, select a blade that is part of the group. The Sun Blade Zone Manager highlights the storage assigned to the blade storage group in the Zoning Config dialog. To modify the storage resources assigned to a selected blade storage group, click Modify Group. The Sun Blade Zone Manager highlights the selected blade storage group (which includes the storage resources currently assigned to the CPU blade server). To remove storage resources allocated to a selected blade storage group, click on the resources that you want to remove. Example: The following illustration depicts HDD 4-7 as selected resources to be removed from the CPU blade server in slot 1. To assign additional storage resources to a blade storage group, click on any storage resources outside the color-coded group that you want to add. To apply the allocation modifications made to the selected blade storage group, click Save. Back up the saved the recently modified resource allocations.